As the Dog scampered away leaving President DU30 and the country in grief and anxiety over so many problems, both Pinoys and Chinoys in Davao heaved a sigh of relief. With the start of the Year of the Earth Pig, the New Lunar Year is expected to bring calm, compassion, peace and prosperity, among other better things. 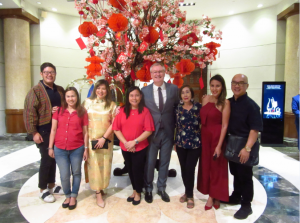 It was no wonder then why Davao’s Chinoys and Pinoys trooped to the Marco Polo Hotel-Davao in droves last Feb. 4, 2019, to celebrate and welcome the new lunar year. As a colour symbol of joy and prosperity, many of the hotel guests and diners wore their best red outfits. 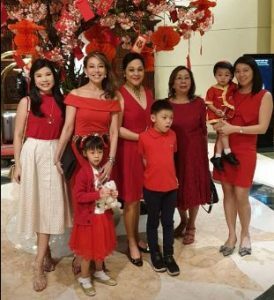 The statuesque Consul of Bangladesh Joji Ilagan Bian was a standout as the Lady in Red beside her husband, businessman George Hao Bian, and their son and daughters plus Josef Tagle Ledesma and guests from Manila joining them. As expected, businessman James Chiew Lee led his big clan, business associates and friends to celebrate and feast on this most important holiday of the lunar calendar. Yes, the Chinoys and Pinoys can now breathe a sigh of relief and start anew with optimism in this auspicious Year of the Earth Pig. 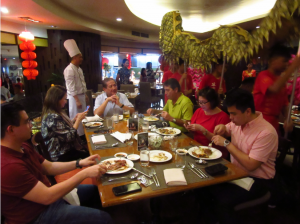 Thanks to Marco Polo Davao’s Cafe Marco and Lotus Court which celebrated the Year of the Earth Pig with their special signature dishes, complete with a parade of dragons and lions in synchronized dances around the hotel for good tidings. 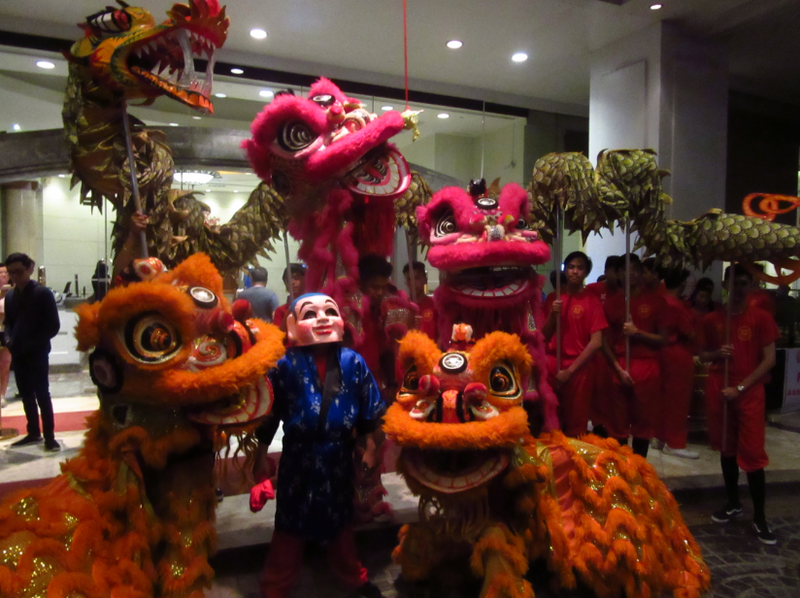 The Marco Polo Davao is acknowledged to have pioneered the superb marketing of the annual celebration of the Chinese New Year in our progressive city. It’s due to the fact that the Marco Polo Hotel chain started in Hong Kong and our very own Marco Polo Davao is also located right at the very edge of Davao’s own Chinatown. For Chinese families all over the world, it is the most important celebration of the year which is also referred to as the Spring Festival. The Marco Polo Davao’s foyer is festooned with a centrally located, traditional pseudo-prosperity tree decorated with red ang paos and gold coins symbolizing blessings or good luck for the lunar New Year. Why, I didn’t see any figure of the pig this time. 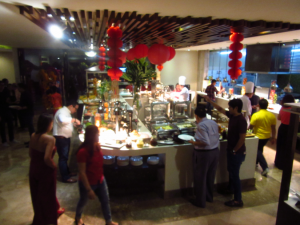 Surprisingly, the Marco Polo Hotel-Davao staff members didn’t wear their Chinese themed fashion this time which could have added a brighter note to the festive celebration. 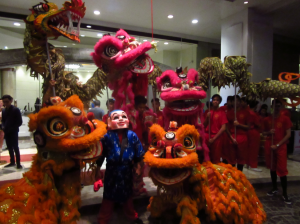 Naturally, the performers of the Davao Lion Dancers Association, with their brightly colored costumes and masks, mightily performed the traditional dragon dance to formally start the evening’s happy celebration. 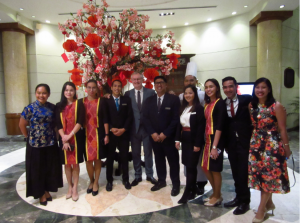 Marco Polo Davao’s new GM James Bevans, who was as friendly as ever greeting guests, and businessman Juanito Yap drew the pupil of the eye of the dragon this year. In attendance as well were Alex and Rose Alcantara along with their family members and friends. Marco Polo Davao’s signature restaurant, the Cafe Marco, indeed, warmly welcomed the guests; and prepared its best “lucky” food like Hot and Sour Soup, steamed Dim Sum, Jelly Fish with Salad, Pork Char Shew, Soy Chicken, Fried White Fish with Black Beans Sauce, Fried Vegetable Spring Roll, and of course, the popular traditional Lechon and Roast Beef, among so many other Chinese delicacies. Just like the Pinoys’ New Year celebration, the Chinoy families find it of particular importance to gather the entire family around a dinner table filled with food to end one year and to start another together. It’s truly a big and happy occasion for a family reunion. Naturally, each one has to eat as well as give the ti-ke (sweet cake in Hokkien dialect), nian gao (new year cake in Mandarin) or other varieties of the glutinous tikoy which, for their stickiness, symbolize family unity. The festivity continues for 15 days to celebrate abundance and to spread good wishes among people special to you. Marco Polo Hotel’s Communications Officer Jeline Gison gave out fortune cookies and oranges to the guests including Davao’s media representatives. The culinary celebration at the Lotus Court, on the other hand, has only begun. The Lotus Court recently just received an award from Philippine Tatler as one of the Best Restaurants for 2019. “At Lotus Court one can indulge in quality Cantonese fare and dim sum offerings with an accommodating staff to serve diners,” read the Philippine Tatler review. The Philippine Tatler award is based on the evaluation of professional chefs and the clients’ critics. Congratulations, Lotus Court and Exec. Chef Alex Destriza. Kiong Hee Huat Tsai/Kung Hei Fat Choi/Xin Nian Hao/Gong Xi Fa Cai! May we have good blessings, peace and prosperity in this Year of the Earth Pig.